It is an established fact that the Danes are the happiest people in the world, though the way happiness can be ‘measured’ still eludes me somewhat. Admittedly if I was that attractive, and my entire country was that attractive, I would probably also be reasonably chipper. This is the country that is home to many great things, Caroline Wozniacki, Viggo Mortensen… and Lego. One of the other great things it is also home to is the 71 Nyhavn Hotel. Tourism has blossomed in Copenhagen over the last decade, in fact it is amongst the quickest growing tourism destinations in Europe. Certainly from the London perspective this makes perfect sense. It is less than two hours from London airports to the Danish capital, and the Metro station is right inside the airport terminal when you arrive. 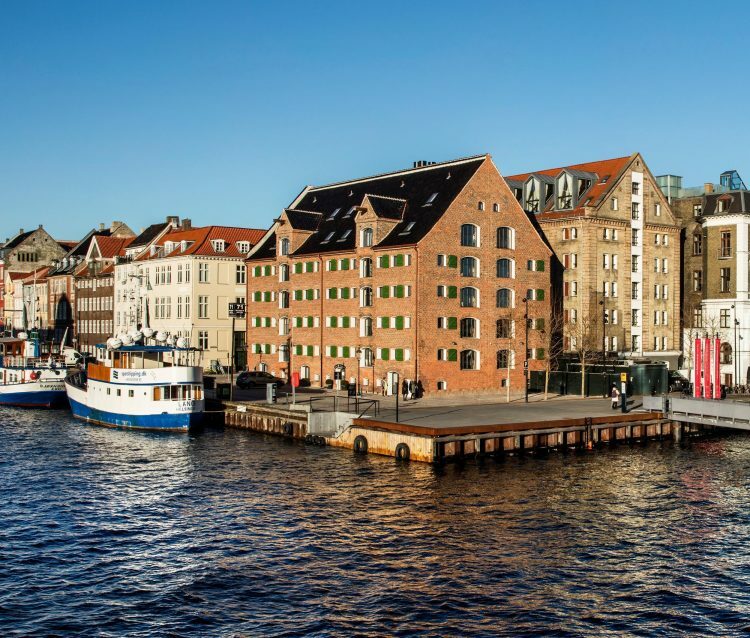 Eight stops will then take you to the edge of that famous, picture postcard harbour, which just so happens to also be home to 71 Nyhavn (hop off at Kongens Nytorv). All of a sudden that Friday post work flight out and the Sunday night turn back seems incredibly easy and enticing. Moreover, the city’s metro runs 24 hours a day and is so simple you could navigate it in your sleep, or even after a few en route gin and tonics consumed at 35,000 feet. Another reason to allow the allure of Copenhagen to reel you in is it’s glittering restaurant scene. 22 Michelin stars have been awarded to no less than 17 restaurants in this gastronomically conscious city of just six hundred thousand. 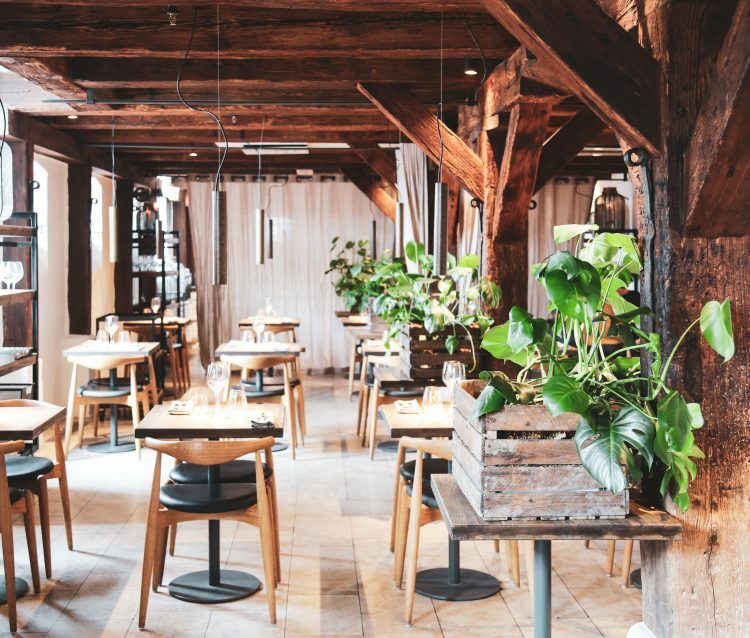 71 Nyhavn represents an absolutely ideal home from home from which willing explorers can sally forth into this gorgeous capital which tells a tale of two cities – beautiful, historic but also hipster and effervescent. 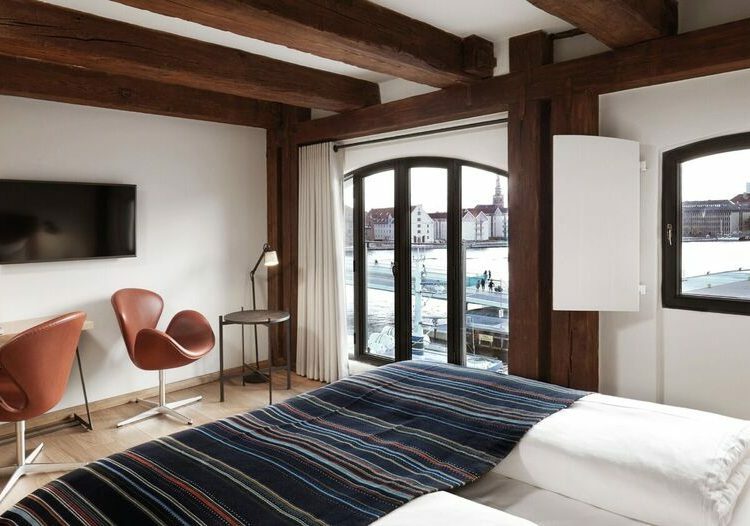 One of the hotel’s key attributes is its location, it is right on the edge of the waterfront where the Nyhavn harbour begins, and runs all the way down to the Royal Playhouse. This is the iconic harbour with the jumbled, pastel coloured buildings which have made the area so ‘Instagrammable’ – or just plain old pretty for the technologically impaired, like me. This location also means that the view out over the waterway is perfectly serene when the curtains are pulled back on your first morning in the city. The hotel building is picture perfect, it is comprised of two conjoining former warehouses – one yellow, one red. The yellow is the younger of the pair, and was erected in 1830. Last year the yellow house was revamped and the bedrooms, the lobby and all communal spaces were given a smart face lift. The red house has been standing on the same spot since 1804 and was also renovated back in 2015. The general air of the hotel is one of simple, classic elegance. 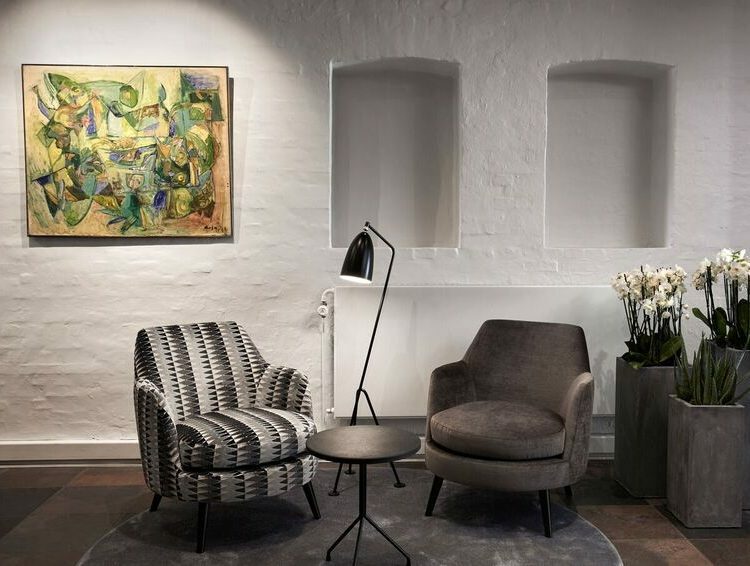 The lobby is chic and handsome with thick, lacquered white washed walls, trendy black angle poise lamps at every highly textured sofa and with the roughhewn original warehouse beams striping the roof and dotted down the centre of the foyer like the rustic Scandi answer to Roman ionic columns. 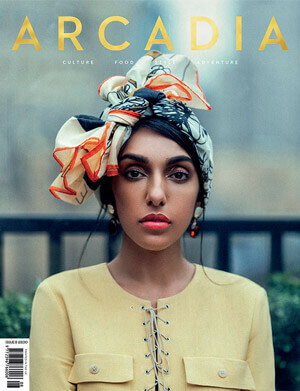 The owner also uses the lobby as a hanging space for art from his own collection – quite the spectacle. Staff are incredibly helpful, and will offer choice morsels of tourism advice with broad, Colgate-white smiles which are just so typically Danish, before pointing guests to their rooms. The lobby beam theme continues into the bedrooms which creates a marvellously authentic and bucolic atmosphere. 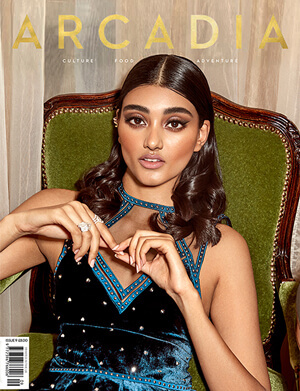 This is a pleasing juxtaposition with the modern, elegant furnishings including the devastatingly comfortable beds from Carpe Diem with their matte, chestnut leather headboards and the Arne Jacobsen chairs. 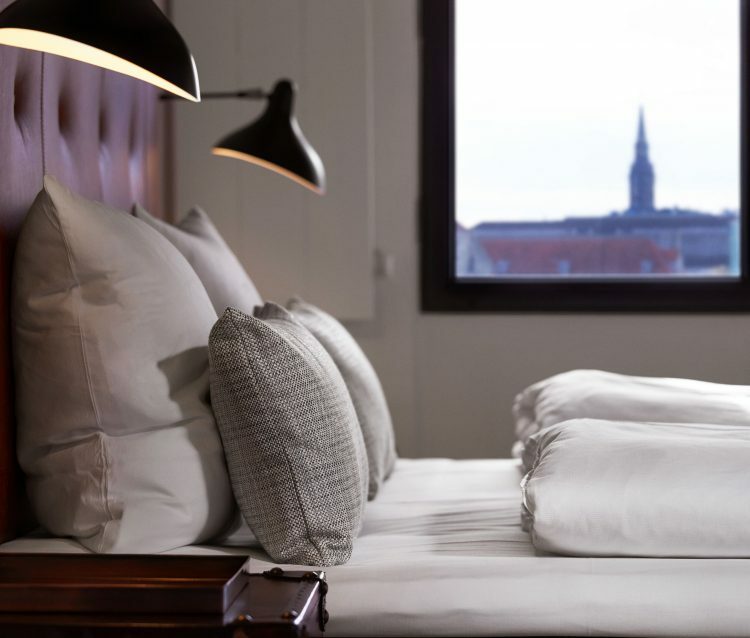 In many respects the bedrooms are an accurate reflection of Copenhagen itself, polished, modern but ensuring that the relevance of the Capital’s history is honoured. The bathrooms are separated from the bedrooms by a sliding, opaque glass panelled door. It recalls the Japanese pagoda style of paper walls panelled with narrow wooden beams – but never fear, this divider is significantly more sturdy and won’t wash away with each hot shower. Shower products are from local brand Karmameju and fill the whole room with a giddy lavender scent. The hotel’s bar is well stocked, particularly with gin which I learned was very much ‘the tipple of the moment’, and is just as effortlessly trendy as the rest of the joint, though special mention must be made for the breakfast. In my experience hotel breakfasts are a sombre and poorly attended affair, with guests staring, bleary eyed, down at a lacklustre coffee which claims to be somehow linked to a cappuccino. Not so at 71 Nyhavn. The dining room is filled with contented holiday makers laying into the freshly cooked omelettes served straight from the kitchen, one side of which opens into the available hot food section, meaning you can admire chef as he knocks up your over easy, or sunny side up each morning. Lashings of smoothie and fresh juices flow freely and there is a plentiful supply of the eponymous ‘Danish’ pastries (which I learned, rather disappointingly, originate from Vienna) not to mention some Danish classics like pickled herring and liver pâté with local bread. 71 Nyhavn represents a perfect vantage point from which to explore this remarkable city. Its location on the edge of the waterway overlooking the handsome bridge across to Christianshavn also means that noise is minimal, with most of the picture hungry visitors sticking to the most multi-coloured section of the harbour, lined with old fashioned fishing boats, further down the inlet. As a result peace is assured. The hotel is truly exemplary in terms of the way it straddles minimalistic elegance and practicality. 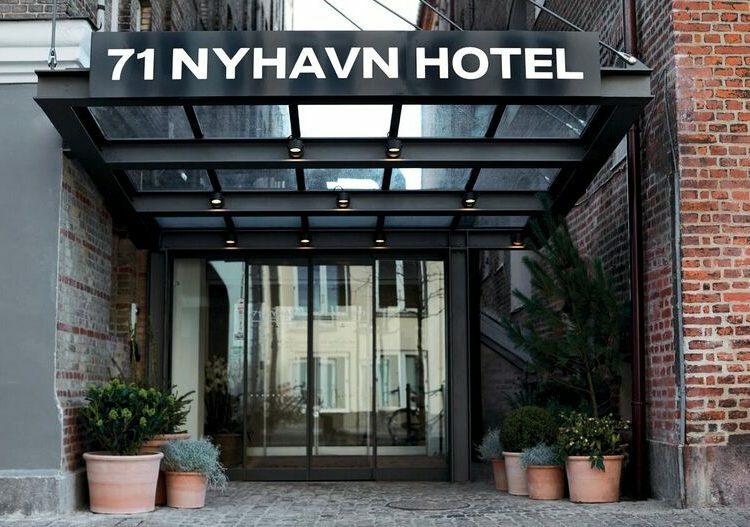 Whether you’re reclining in your endless Carpe Diem bed surveying the view out over the water, or sipping a hipster gin and tonic down in the sleek hotel bar, 71 Nyhavn caters for it all.